A new council sponsored website designed to promote fast-food outlets and restaurants in Eastleigh uses photos of diners enjoying themselves elsewhere – like Canada! The Eastleigh Town Centre partnership which aims to promote business in the town engaged Reading based company Business Fulcrum to produce a site designed to promote the town and make it appear attractive but no actual photos of the town or its many restaurants have been used. 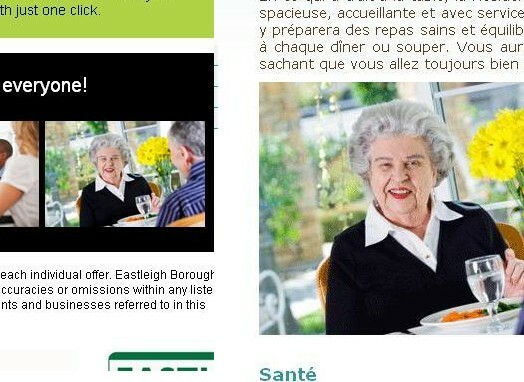 But none of the stock images that have been used represent any of the venues in Eastleigh , in fact one appears to be of the restaurant in the ‘Residence Belevedere’ – an old folks home in Quebec. Same old lady is in Eastleigh and Quebec! Eastleigh news asked the Business Fulcrums director Jane Buswell if she thought the site might be misrepresenting Eastleigh to potential visitors – Why not show people actual photos of Eastleigh and it’s restaurants? You will see they are families, teenagers, business people and those from the older generation. The chosen photos were deliberatively chosen as being close cropped and not representative of any particular food range. They also have contain yellows and greens which aesthetically complement the logo. Visitors to the site are able to subscribe to a quarterly newsletter which lists which restaurants are offering discounts or special deals. The recession has hit Eastleigh’s independent Restaurants hard with only the chains that appear to be coping. 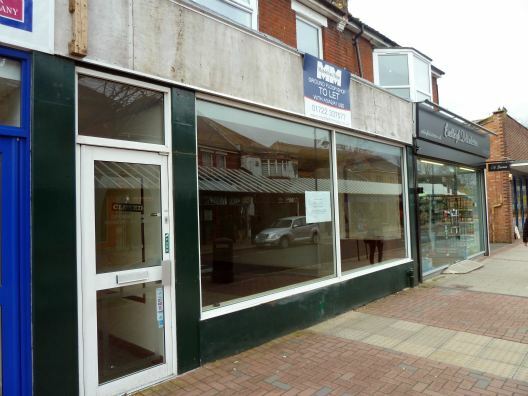 Among the empty retail units in the town Centre is the Guzzle kebab house (formerly regarded as the best restaurant in Eastleigh by Tripadvisor) the Fusion Bar & Grill (Martines), and in the Swan Centre the Oriental Palace and Loft & Break Bar are both vacant. I’m all for promoting business in Eastleigh and independent restaurants and retailers need a hand as they are being squeezed by the big chains but why on earth are there no pictures of Eastleigh? Surely people want to see places they are thinking of visiting? There are over 30 ‘eateries’ but why can’t they all have a piccy and a bit of blurb each? There are plenty of scripts that would rotate photos on the front page too. 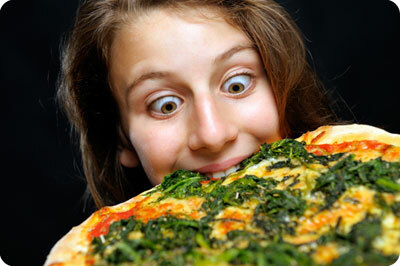 Oh, and I would lose the picture of the spinach pizza , it aint on the menu at the Hut or Dominos’. Mind you, if Business Fulcrum is doing this for free, I’ll take the criticism back! Yes exactly – I don’t understand why the entire contract wasn’t given to a local company. I have to say I really do wonder if the people who put this site together have ever set foot in Eastleigh. Nice one Stephen! This is ridiculously poor, and definitely NOT promoting eateries within Eastleigh. Maybe the council thought the eateries were just too boring and weren’t exciting enough, which meant they had to use fake stock images. This is such a poor example set by the council, there definitely could have been more to make this look good. I bet if a few of us got together, we could make it a lot better! It is such a shame about independent eateries having to close, and chains thriving instead. And the new Sainsbury’s is NOT going to improve this – I have no idea why the survey had a 90% positive feedback. Support the local independents, keep them going!! What I find strange is why Eastleigh Borough Council put such a poor creative brief together in the first place to end up spending money on such a s_ _t and poorly designed website. Even their IT department could have been more creative in putting this site together and that would have been free. Was it the brief or was it that the design company who produced the website (I use the term ‘design’ very loosely) just couldn’t be bothered to be creative that day. Does this website make you want to eat in Eastleigh? I thought advertising was supposed to be persuasive! Having spent years working to advertising agency standards of creative output I would sack any marketing manager who commissioned this waste of hosting space and tax payers money. In this climate most creative agencies would go the extra mile to ensure that they got the next job! Maybe Eastleigh News could ask how the pitch was won in the first place as I would love to see the other agency design pitches that lost!!! This highlights the problem with Eastleigh: It is a railway town. While Eastleigh’s industrial heritage is something to be proud of, there’s no use pretending it’s something it is not. Unfortunately this “pretending” started with the building of the Swan Centre and has carried on ever since. Will ads like this (depicting stock images of old ladies from Quebec with all the colour extravagance of the Americas) resonate with Eastleigh’s railway folk? It may, at least with the younger people reared on a diet of American TV. But as for the older folk, I think I would have tried a more local and perhaps slightly less bright marketing approach. This is such a funny story and one that is just soooo Eastleigh Borough Council. I am shocked that Cllr. Peter Wall is part of this fakery to try and make Beastleigh Eastleigh something it is not. I have always found him to be honest and straight about facts and the truth, clearly I was wrong.! !